The history of the University of Porto is imprinted on the landscape and is part of the identity of the city of Porto. Its extensive built heritage, such as the century-old buildings that house the Rectory and various faculties and research centres of the University, stretches from the historic city centre to the peripheral areas of Porto. Of the buildings that mark U.Porto’s presence the in the city, the University’s Historical Building has pride of place. This building is located in Praça Gomes Teixeira (known as Praça dos Leões), and it is a place where education and research has been carried out by several faculties and other U.Porto bodies for over a hundred years. Moreover, it has survived demonstrations and major fires to withstand over two centuries of history. This building has housed the Rectory services and part of the University’s museums since 2005. U.Porto’s historical buildings include: the old building of the Medical-Surgical School of Porto that housed the Faculty of Medicine until it was transferred to S. João Hospital, in 1960, and the Abel Salazar Institute of Biomedical Sciences (between 1975 and 2012); the Braguinha Villa (headquarters of the Faculty of Fine Arts); the former buildings of the Faculty of Engineering (in Rua dos Bragas, and currently the Faculty of Law), and the Faculty of Pharmacy (in Rua Aníbal Cunha), which was inaugurated in 1937, on the occasion of the Polytechnic Academy’s centennial commemoration. In addition to the educational establishments, a journey through the history of the University of Porto stretches beyond the city limits to take in the Botanical Garden of Porto, the Meteorological Observatory of Serra do Pilar (headquarters of the Geophysics Institute of the University of Porto), the Marine Zoology Station (the first aquarium of the city, created in 1914, in Foz do Douro) and the futuristic Professor Manuel de Barros Astronomical Observatory, in Vila Nova de Gaia. U.Porto's built heritage has been growing over time with the construction of modern buildings, harmoniously integrated into the urban landscape. 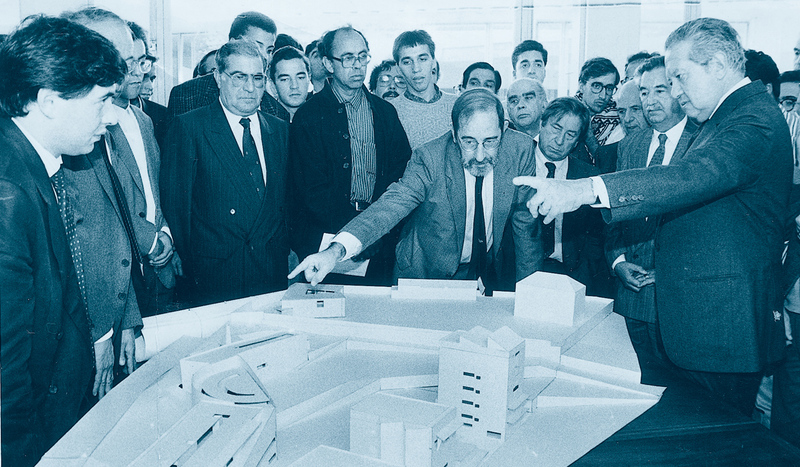 An example of this process, which started in the 1990s and has intensified in recent years, is the building designed by the famous architect Álvaro Siza Vieira (former student and professor of the University) that has housed the Faculty of Architecture since 1992. The development also includes the ICBAS institute and the Faculty of Pharmacy, in Rua D. Manuel II (Site I); the Faculty of Arts (1995) and Faculty of Sciences (2005) in Campo Alegre (Site III) and the buildings of the faculties of Dental Medicine (1997), Sport (1997), Engineering (2000), Psychology and Education Sciences (2006), and Medicine (2012) and also the INESC and UPTEC institutes, all located in the Asprela area (Site II). Moreover, there are several museums with priceless collections. And great many of those treasures, collected over the years, are open to the public in the University’s various museums. Find out more about U.Porto’s Buildings.